A century later, Doug Smoot finally gave in and joined forces with the foundation dedicated to saving the academy building. Smoot became the motivating force in raising $6 million dollars, to add to Provo City’s financial commitment, to renovate the building into the Provo City Library at Academy Square. 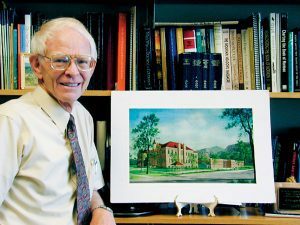 Smoot has created a book, Miracle at Academy Square, available at the BYU Bookstore, that details the academy restoration.